Last night was my first full nights sleep in four months. As I look around the house and see bunches of flowers and feel the bone tired exhaustion...I also look for the new baby that all these symptoms usually indicate....the baby has left home. I hear about the baby’s impact on the wider world through emails and phone calls. I thought it was a small or medium sized baby but it seems to be striding out there making its presence felt in a large way. My army brother says that what I am feeling is battlefield syndrome...the result of living on the edge of your skin, for a long time in the field, then a protracted engagement/fire fight and then back to base where you are safe. He warns me that now my health will pack it in because that always happens in battlefield syndrome. The Spinning Gold conference was huge...I don’t think I could adequately describe it for anyone who wasn’t there. We set out to deliver the best conference we could....and we did. I am in awe of our volunteers from the Whitireia publishing course. They looked at our planning nodded their heads and said leave it to us. We left lots to them. Our committee were the best. We all looked at each others work levels during the conference and picked up the slack where we had to, everyone pitching in. Some of us are still working hard. Helen filmed three big sessions and is now editing them. Fifi and I are wading through the emails with our eye on our report to Creative New Zealand. Pippa is tracking and paying bills. The blog keeps going....Already there are plans being made by presenters to capitalise on the extraordinary energy and enthusiasm generated by the conference. For many people the sheer honesty of the presentations was the key impact of the conference. Nobody said this field is easy...especially the publishers. The sheer bravery of the pitch slam is uppermost in my mind. I watched people who were truly nervous...walk up those stairs, crack jokes to help out others and go through those doors to face an editor or agent and pitch their work in three minutes. Their writing selves laid bare. I was terrified...I kept thinking, I am insane... I am insane... as I walked up those stairs...others around me had practised and honed their pitches...all I can say is that I spent Friday night stressing about the scheduling and dreaming that I burst into tears when I went through the door....I didn’t as it happens. Thank God for Brian Falkner, whose magnificent workshop, Make a Mark, on Saturday morning impacted enough so I could think of a tag line for the work I was pitching. Even now as I think of it I get goose bumps. I can’t believe I pulled it off. We have had the most amazing emails...the ones that have broken through the haze and left me with tears are the emails from people who thought we had planned the conference with them in mind. When more than one person says that, you know that you have struck a chord that has resonated through the community of Children’s Writer and Illustrators. While I was being the manic front, Fifi was being the manic back, holding internet connections together by sheer force of will. I am in awe of my incredible co convenor. She didn’t get to see much of the conference sliding in and out unless she was introducing or on a panel.... Fifi is an inspiration, a force to be reckoned with...her huge week is not over. Along with fellow delegate Lucy Moore, Fifi will find out if she has won her section at the Wearable Art Awards on Friday Night....My fingers are firmly crossed for her. She has given so much time to making the conference a success and putting together her WOW entry during the process...She deserves every accolade. This morning while telling Fleur Beale how busy I was....she knows... she's on the Spinning Gold Committee too ...we got to talking about the power of image... specifically images that you manufacture as marketing yourself. I was mentioning them in relation to the billboards around at the moment with pictures of Ms Hilton and the word Vacant. The billboards are advertising that the space is for rent. Fleur thinks that Ms Hilton has a good PR machine as she is known for being known, the drug of celebrity. My business card is finished and I’m very pleased and judging by others reactions....they are cooly spiffing! I’d show you but I’ll wait until after the conference is over...(really it’s because the camera has left me to go cover a story with my husband. )The image is fantastic! Less than a week to go and I have a lot to get through....My personal goals for the conference are now becoming urgent must do items which I have to find time to address before Thursday, the day before the conference opens! 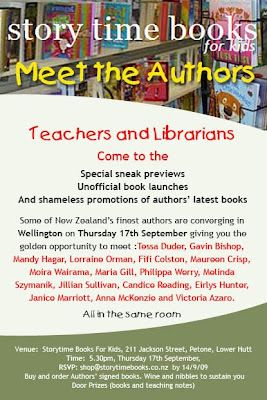 On Thursday night there is an event at Story Time that I am involved in and have to prepare for and I would love to go to the Speculative Fiction event in town on the same night with one of our Spinning Gold Panellists. However with the urgent press of details to be ticked off, I am in danger of getting to the conference and quietly collapsing.... Just prop me in a corner. (Icky image) The committee have all worked their socks off! Like I said the IMAGE has POWER.